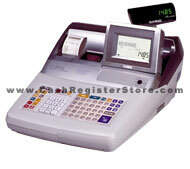 The TE-3000 is an outstanding register with features including a tiltable 5.2 inch wide color LCD screen with 2 lines x 16 characters and a 1 line numeric operator display offer the customer a clear view of transaction information. Choose from 5 selectable colors for the LCD display. This LCD screen displays characters larger than any other cash register system which is great for people with limited vision. The keyboard is very expansive for a raised keyboard cash register. There are 30 department/plu keys offering more keys them most brands and models on the market. The Casio TE models ranging from TE-3000-TE-8500 feature flash card technology. The flash cards serve as a secure program back-up. When your register has been programmed, save your file to the flash card, and store it in a secure location. In the event that you lose your program via electical surge, program tampering, etc, you can reload the program to your register. A 2-station, 14 lines per second, silent and wide 58mm printer offers the option of using the built-in auto cutter or tear bar to generate a customer receipt. The printer includes drop-in paper loading with graphic and watermark logo printing for professional presentation of customer receipts (w/ optional software). Thermal Alpha-Numeric, 14 lines per sec.